This all-in-one chicken dinner is sure to become a family favorite! Add a thick slice of Swiss Cheese Bread and dinner is complete! 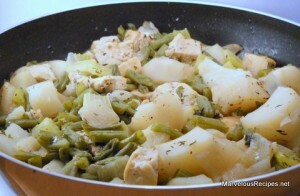 In a large skillet over medium heat, brown chicken in oil and butter for 5 to 6 minutes on each side. Add all the remaining ingredients and stir to blend well. Bring to a boil. Reduce heat to Low and simmer for 50 to 60 minutes or until chicken juices run clear. Discard bay leaf before serving. Makes 6 servings.